How well does your organisation understand and manage its governance requirements? 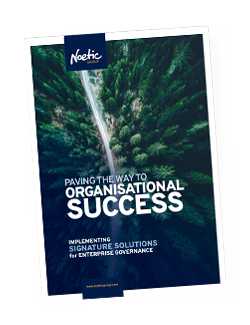 Noetic provides evidence-based advice and supports leaders to make improvements that better meet professional and community expectations about enterprise governance. We undertake expert reviews for projects, programs and day to day operations to identify where enterprise governance can be optimised. Our analysis provides clear direction for action, complemented with strategic options, enhanced procedures and targeted communication. Noetic takes a collaborative approach and works directly with your staff to meet governance reporting to boards, executives or to Parliament. We build capability within your governance secretariats and enterprise reporting teams. We support your Community of Practice and assist you to engage constructively with key stakeholders. Noetic’s team approach means that you have mentors on hand for both your senior leaders and your operational staff.